One of my best friends recently got married at the Disneyland hotel (yes, they are Disney nuts). 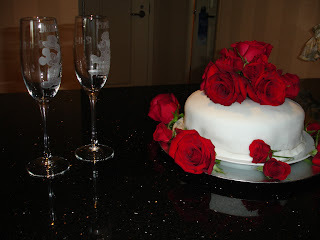 I got brave and decided to make not just my first fondant cake, but my first red velvet cake for the intimate event. Above is my first creation that I still can't believe I did! Amazing what gorgeous red roses add to a cake.